SuperFogeys - ANNOUNCEMENT! 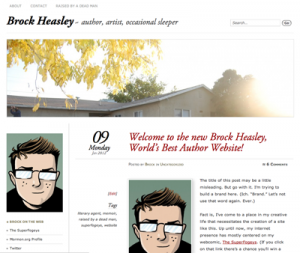 The New brockheasley.com! Today marks the launch of my new website, brockheasley.com. I’ve been heading towards this for a while now, even if I didn’t realize it. In this day and age, if you’re an author–you need a website. I always saw this site as my hub, but I just don’t think it makes such sense for people looking for a writer to come here to a webcomic site. So, now I have a new site where you can find blogs, news on my book, and even a dedicated page with info on my book. What does that mean for this site? Well, not much, really. I’m gonna be keeping the more personal stuff over on my new site. That probably means you’ll see an uptick of SuperFogeys-related content here in the blog area, which hopefully is good news to most of you. If you’ve enjoyed some of the blogs I’ve done on stories from my life, I’d encourage you to bookmark my new site or subscribe to it via email. Should be lots of great stuff to come over there. More importantly, the new site is designed to support my memoir, Raised By a Dead Man. Your comments and visits are the best way you can lend a hand and show your support for my new endeavor and insure that you get to hold it in your hot little hands at some future date! Also, for those of you that follow me on Twitter, I’ve launched a new SuperFogeys account for all the news and updates SF-related. I’m gonna be slowly backing away from the SF content on my usual Twitter account to make it more accessible to those discovering me through my writing. Hope to see you all over on the new site! It’s a new era.